There are many elderly people in Rwanda. They are predominately widows, but also widowers, who have no tangible ways to support themselves. Inshuti International, along with Good News International in Rwanda, seeks to provide aid and support through health insurance, food and daily basic needs, and projects that promote sustainable income. This assistance is particularly crucial for “”Inshike” – the elderly who are orphaned with no living relatives. As the survivors of the 1994 genocide in Rwanda are aging, there are many elderly people predominately widows, but also widowers, who find themselves with no tangible ways to support themselves. This leaves them vulnerable to untreated illnesses, including AIDS, and unable to sustain a healthy diet. This elderly group, range in age from 65 and up, are living below the poverty level. They were wounded in the genocide, and are both physically and emotionally handicapped. Many are unable to work and generate any income. Within this group there are also those who would be called “Inshike”. This group has no living relatives who can provide aid and support. Most Inshike eat only one meal a day and have inadequate, if any, health care insurance. Although government housing is available through a lottery system, those who have received housing do not have the funds to buy food, furniture, or even a mattress to sleep on. In order to understand the variety of needs that exist for the elderly, a team from Inshuti met with GNI staff to conduct a study of the Rugalika community served by GNI, which looked at individual cases to determine the needs of the elderly in the rural areas of Rwanda. The following is a result of that study. There are five sub communities of Rugalika, one of which is Nyarubuye. Within this community, there are 48 widows and 5 widowers above the age of 65. Note, 10 of these widows are Inshike. GNI is currently providing funding for health insurance for the neediest fifteen widows, as identified by the community leaders. Ten goats have been distributed in Nyarubuye by GNI on behalf of Inshuti International. 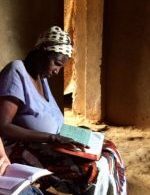 The GNI community leaders gathered a group of thirteen widows together to meet with the Inshuti summer team to hear about the needs of this group, and how they are working together to address these needs. Due to government relocation programs, many of these women had been relocated to Rugalika. Because this is not their home area, if they own land it is not in close proximity to where they are living. As a result, their land does not contribute to their sustainability. Selling their land and buying new land is not a feasible solution. Although there are younger people in the community who care for the elderly, due to the extreme poverty in the area the younger generation is unable to adequately provide for them. Many elderly identified insufficient food as their biggest problem. After identifying their needs, the GNI staff, community leaders and the Inshuti team discussed how to address these needs. We worked together to engage in problem solving, and to better understand how to create a supportive partnership that would empower the community. There was conversation surrounding the possibility of hiring people to cultivate the land they own, however due to the distance of the land, supervision would not be possible. The women identified small animals such as goats, chickens, and rabbits, as sustainable resources. In light of their physical limitations, caring for these animals would be within the realm of their capability, whereas agricultural work is not physically feasible. 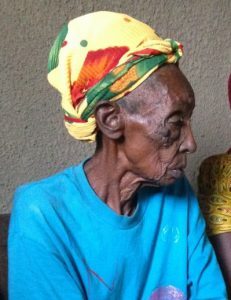 Terese is 93 years old and living in a house that was built by a government program for genocide survivors. She lost her husband prior to the genocide from illness. Of her nine children, seven died during the genocide, one died after the genocide from cancer, and she remains with one son who is married. “I have a big house. I have a kitchen but never use it. I have all this, but living is another story.” The cultural implication of these words is that although she was given a house, she has nothing to put in it, and lacks food and the basic necessities of life. Teresa is 85 years old, and lives with her granddaughter. She lost her husband and four children in the genocide. Her house was also built by the government for genocide survivors, but her roof is rusting and has holes, so when it rains water leaks through the roof into the house. She suffers from dizziness, back pain, and a potential liver problem. Teresa was one of the fifteen recipients of health insurance from Good News. She has a bed frame, but sleeps on a worn, thin, foam mattress that needs replacing. Josephine was one of the first widows to come to GNI. She lost everyone in the genocide. She is in her 60’s, and is called an “Inshike” – an orphaned widow, who cannot remarry. She has taken some bad falls in her home, and hurt her foot, knee and wrist. She felt this was a spiritual attack. She has the joy of the LORD, and she is trusting in God and reading her Bible every day! She also has taken two boys in, and although it’s not been made legal, she has adopted them into her family! Based upon the needs in the rural communities of Good News International in Rwanda, the following are different opportunities for partnerships. Health Insurance: The annual cost of the government sponsored health insurance for an individual, which covers only basic needs, is $5.00 per year. Health insurance will be delegated based upon individual need as identified by the GNI community leaders. Elderly Subsistence Fund – This is a sponsorship program that would provide funds for food, basic daily needs, and supplement health care costs not covered in the basic health insurance plan. Cost of sponsorship is $30 per month. Mattress Contribution: – Many of the elderly people are sleeping on wooden frames with thin, worn material or, on the floor on mats. The cost of a quality foam mattress with sheets is $60.00. Sustainable Income Projects: Goat ($50.00); Rabbit ($8.00); Chicken ($8.00). When animals are purchased, they will be distributed based upon individual need as identified by the GNI community leaders.